Amongst the collection of ducks on ancum were 211 Wigeon and 18 Pintail. Wader numbers were reasonable with 650 Golden Plover, 72 Sanderling, one Ruff, 127 Snipe, 39 Black-tailed Godwit and a Common Sandpiper. 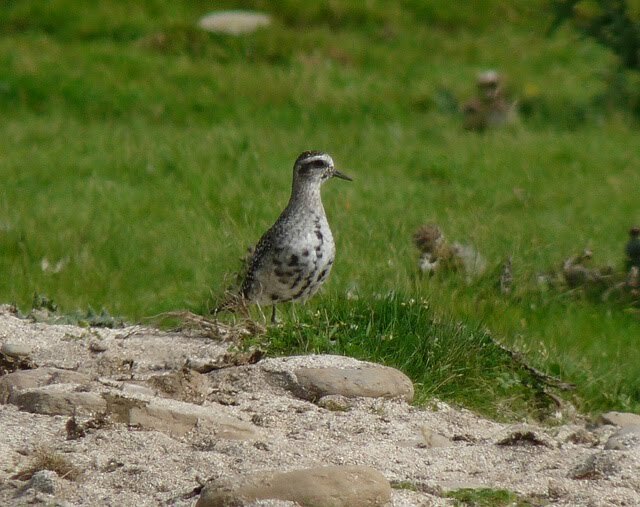 The American Golden Plover was faithfull to its chosen field for the day while passerine wise there were 150 Meadow Pipit and an island record count of 92 Lapland Bunting. On the 29th there were 63 Knot, 40 Purple Sandpiper, one Ruff, 36 Black-tailed Godwit, a Wood Sandpiper, 172 Turnstone and 53 Lapland Bunting. On the 30th there were 142 Wigeon , 14 Pintail, a Hen Harrier, 221 Turnstone, 180 Linnet and 49 Lapland Bunting. 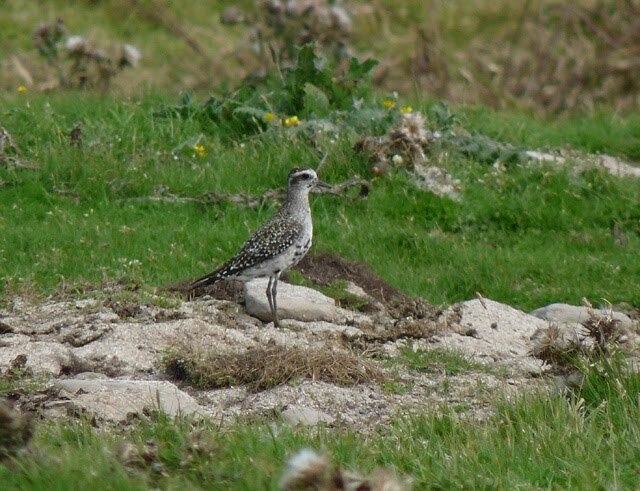 The best though was a moulting adult American Golden Plover in with Golden Plover at lenswick. 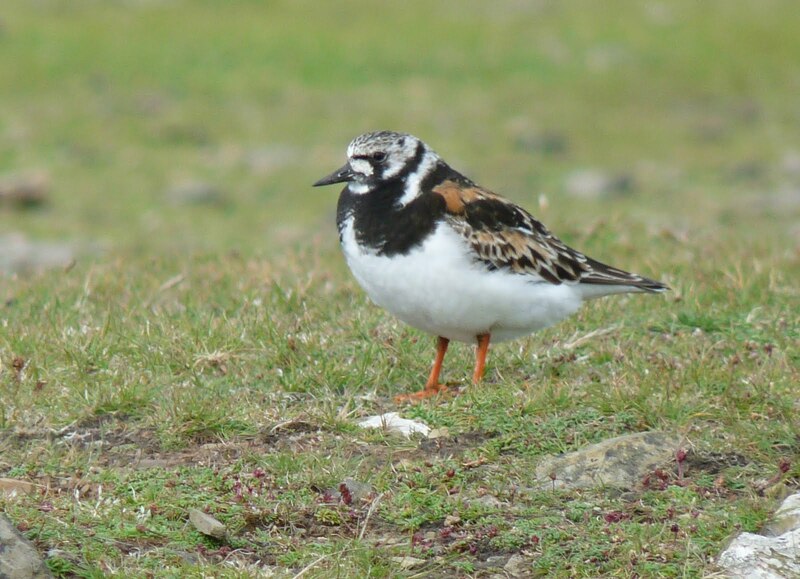 On the 27th 150 Wigeon were on ancum, a Peregrine and a Merlin were seen, 28 Black-tailed Godwits commuted between ancum and gretchen, 60 Swallows and 20 Wheatears were around the island, a single Willow Warbler was at holland and a Lapland Bunting flew over twinyess. On the 28th the first Sparrowhawk of the autumn was seen, 24 wheatears werecounted, the Wood Warbler was in holland and two Willow Warblers were seen. The event of the day goes to Lapland Buntings when 58 were counted betwwen the links and the lighthouse area. On the 25th a Common Sandpiper was seen on the west side. A good count of ducks on ancum included 105 Wigeon, 89 Mallard and 11 Pintail. A hours sea-watch produced two Sooty Shearwater, three Manx Shearwater and a blue Fulmar. The 26th saw the Barred Warbler at holland again where it was joined by a Wood Warbler. Three Willow Warblers were dotted around the island and the Common Sandpiper was again seen. A hours sea-watch in the afternoon produced a single Sooty Shearwater, 11 Manx Shearwater and two Storm Petrel. On the 22nd the Barred Warbler was still at holland along with seven Willow and two Garden Warblers. 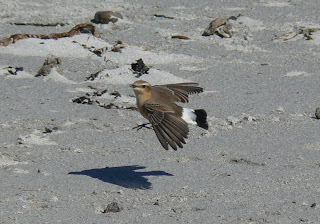 67 Knot where on the links and a Swift was also seen. 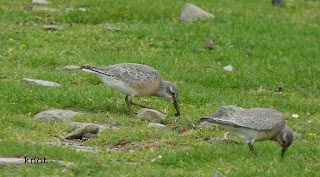 On the 23rd three Common Sandpipers where near the pier but warbler numbers had dropped to one Garden and two Willows. A two hour sea -watch produced three Sooty and 17 Manx Shearwaters, 26 Storm Petrels and 242 Kittiwake. 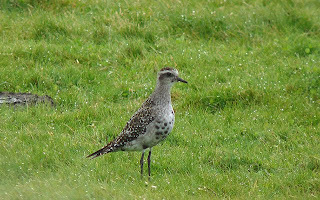 On a windy and increasingly wet day birding wasn't too easy, 44 juvenile Bar-tailed Godwits on nouster beach were new in and the Wood Sandpiper was again on gretchen. A hours sea-watch early afternoon produced three Sooty and seven Manx Shearwaters and two Storm Petrels though viewing wasn't easy due to the weather. A Cuckoo was also seen by a visiting birder. 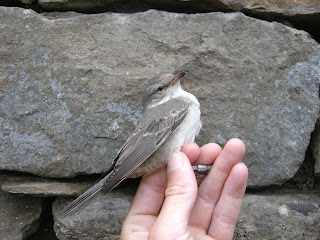 The Barred Warbler was still in holland this morning where five Willow Warblers and a Garden Warbler were trapped. 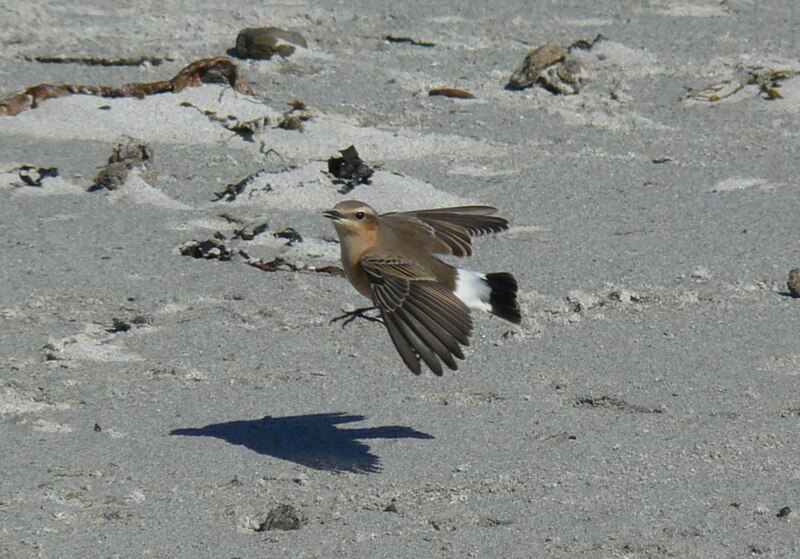 Another Garden Warbler was at westness. A hour and a half sea-watching produced just two Sooty Shearwaters and singles of Manx Shearwater and Storm Petrel. 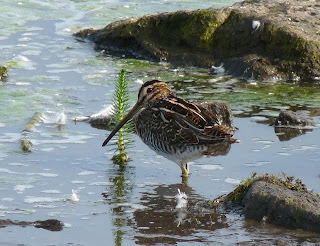 Two Common Sandpiper and a Wood Sandpiper were also seen. 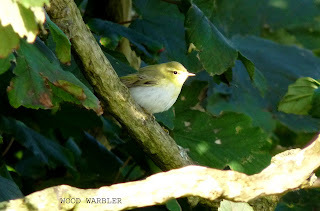 Around holland this morning were eight Willow Warblers, a Wood Warbler, a Garden Warbler and a Barred Warbler. 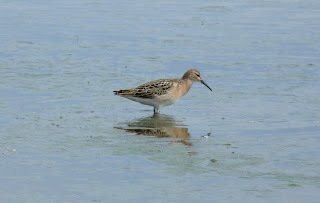 Two Common Sandpipers were seen on the banks and two Ruff were seen. A two hour sea-watch in the afternoon produced 10 Sooty Shearwaters, 11 Manx Shearwaters, 802 Fulmar, 105 Storm Petrel and 85 Kittiwakes. Another day of near constant rain. Three Willow Warblers were seen, two Ruff and a good count of 133 Redshank. A two hour sea-watch in the afternoon produced five Sooty Shearwaters (the first of the year ), 555 Fulmar, 25 Storm Petrel, 233 Gannet, 11 Great Skua and 14 Kittiwake. Drizzle and rain all day has hampered birding a bit, despite this two Willow Warblers were seen at holland, a Black Redstart was at rue and a Wood Sandpiper was on gretchen loch. Six Willow Warblers where dotted around the island today and the first Pied Flycatcher of the year was seen at sangar. A flock of eight Herons flew onto gretchen in the afternoon. Through the sterling work of the malli-ringers 150 pulli Fulmar have been ringed so far this year. 23 Storm Petrel and a Leach's Petrel were caught overnight. A Barred Warbler was trapped at holland in the morning. Four Willow Warblers were seen and a juvenile Hen Harrier was over hooking. Three Willow Warblers where in holland gardens in the morning. A collection of waders at the lighthouse area included 43 Knot, 75 Turnstone, 22 Bar-tailed Godwit, 12 Dunlin and a Whimbrel. A Kestrel was seen near the observatory in the afternoon. The Willow Warbler was still at holland on the 12th and the 13th when another one was seen at purtabreck. 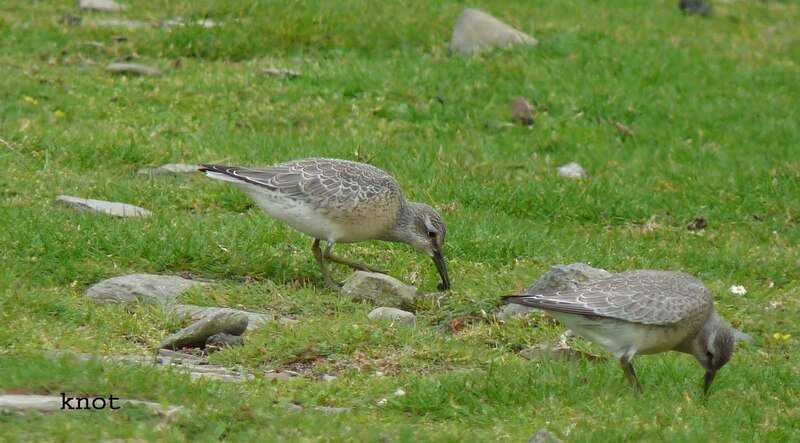 Also on the 13th there were three Ruff, 10 Black-tailed Godwits, 38 Knot, 93 Turnstone and a Peregrine. On the 6th two Ruff were seen. A male Crossbill was near gretchen on the 7th. A Greenshank was on gretchen on the 9th. Two Ruff were again seen on the 10th. The 11th produced the first Willow Warbler of the autumn and a juvenile Common Redpoll was at holland. On the 4th a concentration of ducks on ancum contained 93 Mallard, 6 Shoveler and 3 Pintail. Elsewhere there were 300 Golden Plover and a Chiffchaff. An hours sea-watch on the 5th produced 5 Manx Shearwater and 27 Storm Petrel. 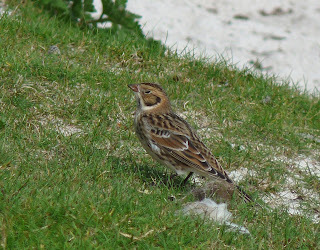 Also on the 5th there were 98 Sanderling, 73 Dunlin, 73 Swallow and 2 Kestrel. The highlights of this period were: a Crossbill on the 21st and 22nd July, a Green Sandpiper on the 22nd, a Ruff on the 2nd and 3rd August.